← Are Ron (and Rand) Paul Secretly in Leauge With the UN ?? In the mid-1980s when I was a graduate student in England, my parents came to visit and my mother ended up getting a first-hand look at socialized medicine. It was my dad and mom’s one-and-only trip to Europe — a very big deal — and I wanted to show them as much as I could. We crossed the English Channel to France and drove to see the cathedral at Chartres. The first night there, Mom slipped and sprained her ankle. By morning, she couldn’t walk and was in need of a doctor. We ended up at a hospital where, with no wait at all, she got X-rays and a friendly, highly competent female doctor checked her out and wrapped her leg. As we were leaving, my mother asked where she should pay the bill. This was hard to translate — and not just because of the gap between French and English. The hospital staff tried to explain that there was no charge. My mom did not think that was right. She felt responsible. She wanted to pay. After a bit of back and forth, it began to dawn on her that not only was there no bill, but the very idea that there should be one was foreign to these citizens of a country where healthcare was a right, not a commodity. When we got back to England, Mom had a cast put on her leg. In the little village clinic, there was a bit of a wait and the doctor was perfunctory, but the deal was the same as in France: free of charge. My mother’s experience with socialized medicine made her feel like a bit of a freeloader. She was, after all, not a taxpayer in either of these countries. Still, she did learn something that many Americans — and particularly many members of Congress — do not understand: European-style socialized medicine is not a hellish system without redeeming qualities. Doctors are expert and treatment can often come without a wait. If you are poor, you do not have to seek primary care in an emergency room, as is often the case in the United States. Even tourists do not need to worry if they hurt themselves or get sick; care is available for everybody. 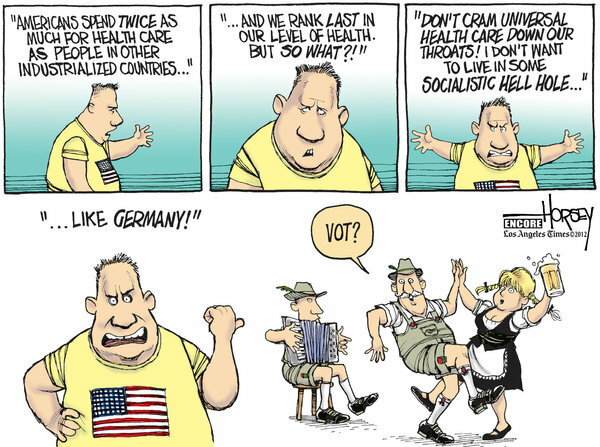 It is a fact that European countries spend far less on healthcare than the USA. It is also a fact that Europeans, as a whole, are healthier than Americans. You would not learn that by listening to conservative opponents of the new healthcare law. They seem to believe the most damning complaint to be made about “Obamacare” is that it is moving the country toward a European-style, government-run system. There are, in fact, several healthcare systems in Europe. They vary in quality. The most notorious, perhaps, is the British system, though most of the horror stories about rationed care, long waits for operations and shoddy service are either outdated or not typical. What is true is that, if you have money, you can buy into better care in Britain. Nevertheless, Brits uniformly believe universal access to healthcare is a proper principle and they are willing to pay for it. Germany has what some believe is the best system. It is built on private insurance plans, but the companies that provide insurance are strictly regulated by the government so that price-gouging cannot happen and no one is denied coverage. Obamacare, by comparison, still leaves the insurance companies mostly in charge. Far from “putting the government between you and your doctor,” as Republicans allege, it leaves insurance companies between you and your doctor. There is very little that is socialistic about the new American healthcare scheme other than the fact it starts with a belief that every citizen should be able to get affordable healthcare. Whether it meets that goal is in question precisely because it is far less comprehensive and simple than the European systems. An American healthcare system should be built around the needs, desires and philosophy of Americans. We do not need to do things exactly as Europeans do. But it is ignorant, if not infantile, to cringe in fear whenever someone suggests that Europeans might have a good idea or two about how to keep people healthy. Unlike Americans, Europeans have found a way to do it without allowing insurance companies and the pharmaceutical industry to drive up costs and run the whole show. This entry was posted in obama, politics, romney, social, taxes, Uncategorized and tagged affordable care act, healthcare, obamacare, socialism. Bookmark the permalink. Excellent. Reblogged to my site. Thank you. Just noted the title should be European, not Euorpean.